I’m Tom Meyers, Stress Coach and welcome to this weeks episode of Health Matters. On the 7th of April The World Health Organisation celebrates it’s World Health Day. This year the WHO will blow out 66 candles and although it has done some great work over the years it faces big new challenges. Challenges like work related stress that is effecting 1 in 4 employees and is associated with the increase in conditions like back pain, anxiety, depression and burnout. But what is health? Obvious as it may seem but have you ever asked yourself this question? On radio x we’re going to do just that. Next week from the 7th till the 11th of April Radio X is organising the Health Awareness Week. A week where various therapists will be interviewed or come to the studio to talk about health. However health is about all of us so we’re hoping to hear from you too. 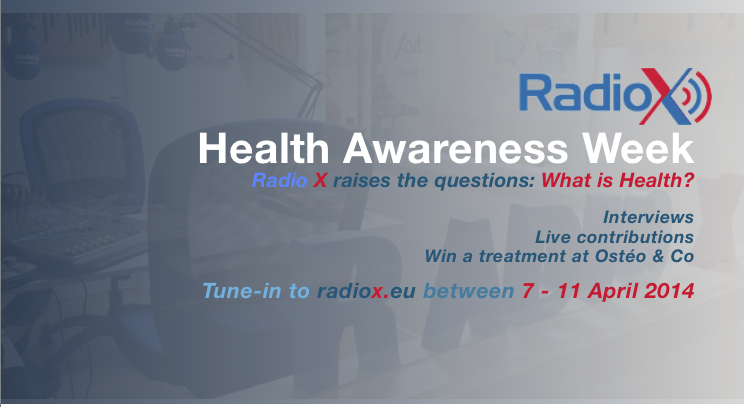 Want to contribute to the Health Awareness Week then keep tuning in to Radio X and also interact with us on our Facebook page and maybe you’ll win one of the various consultations at Osteo & Co in Woluwe, Brussels. To get you in the mood for the Health Awareness Week lets see how health currently is defined by the World Health organisation. According to the WHO, health is a state of complete physical, mental and social well-being and not merely the absence of disease or infirmity. Infirmity meaning physical or mental weakness. This definition was adopted at the birth of the organisation in 1948 and hasn’t been amended since. However what I wonder about is – is health a state? A state meaning a particular condition that someone is in at a specific time? I rather see health as a dynamic process that adapts itself constantly. You are not the same in the morning then in the afternoon or evening. When you’re facing mental or physical challenges health must be balanced in a different way then when you’re lying on the beach. Health what is it? What does it need? Is the idea you have of what health is, in alignment with what your biology dictates what health is? All questions that we need to reflect on and that will be addressed in the Health Awareness Week here on Radio X and no I don’t presume that will find the ultimate answers but I sincerely hope it will contribute to reflection and hopefully some aha moments. We on Radio X will start the dialogue but hope you will carry it on to your family, friends and colleagues as Health Matters today. I’m Tom Meyers Stress Coach for Body & Mind have a great week and hope to hear from you during the Health Awareness Week.